During fall, I get obsessive over using fresh vegetables in baking. In Poland, autumn brings hundreds of squashes, different in shape, size, and color, my favorite being a Hokkaido squash. The softball-sized squash has a flesh resembling a bright sunset orange sun. The reason I love this squash is because it is so versatile; I make the puree and use it for pumpkin soup, pumpkin pasta, etc. 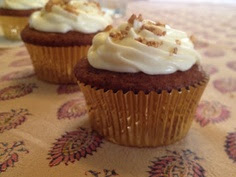 But I particularly like the flavor in these cupcakes, especially how the cinnamon brings out the flavor in the squash. Using any kind of oil in baking, I find, gives the dish a moist crumb, it works the same way in a carrot or red velvet cupcake. How moist they are! In a carrot cake, I especially like the addition of nuts. In this recipe, eating the nuts are like opening presents on christmas. They fill you with joy. I encourage you to try this addition if you can. Another thing I like about this particular recipe is there is only one spice. Cinnamon. Cinnamon is my favorite fall spice, and it works so well in this cupcake to bring out that wonderful flavor of fall. I had made numerous recipes that require cloves, or allspice, but I have found that in pumpkin cupcake, the stronger spices detract from the delicate flavor. And one more thing, you don’t really taste the pumpkin in this cupcake- it’s like a secret ingredient! Seriously, it tastes just like a carrot cake, especially with the sweet addition of cream cheese frosting. This is a MUST for fall! Do not hesitate to give it a try! 1. Preheat the oven to 350 F or 180 C. Line a cupcake tray with 12 paper liners (makes 12 regular sized cupcakes). 2. In a bowl, combine the flour, baking powder, baking soda, and salt. 3. In another bowl, mix together the sugar and oil. Stir in the pumpkin and eggs. 5. Using an ice-cream scoop, fill the paper lines about 2/3 of the way through. 6. Bake 30 mins, or until a toothpick inserted in the center comes out clean. 7. When cooled, frost with cream cheese frosting (see below) and garnish with chopped nuts and sprinkles of your choice. 1. Beat together butter and cream cheese until well incorporated. 2. gradually add in powdered sugar. 3. Whisk in vanilla extract. 4. Refrigerate until icing reaches desired consistency. 5. Using a piping bag with a 1M tip, pipe the frosting onto the cupcakes. You could do this either way you want. Hi! I was writing down your recipe to try it and when I got to the method part, it says to add the baking soda. I didn’t see baking soda measurements listed in the ingredient list. Can you help me out? Thanks! Hi Martina! It’s definitely listed up there, but in case you don’t see it, it’s 1 tsp. Hope you enjoy the cupcakes!